This is the first in a series of posts about how different demographic groups in the U.S. have fared in the digital age. Nearly 30 years after the debut of the World Wide Web, internet use, broadband adoption and smartphone ownership have grown rapidly for all Americans – including those who are less well off financially. But even as many aspects of the digital divide have narrowed over time, the digital lives of lower- and higher-income Americans remain markedly different. Roughly three-in-ten adults with household incomes below $30,000 a year don’t own a smartphone. Nearly half don’t have home broadband services or a traditional computer. And a majority of lower-income Americans are not tablet owners. By comparison, many of these devices are nearly ubiquitous among adults from households earning $100,000 or more a year. 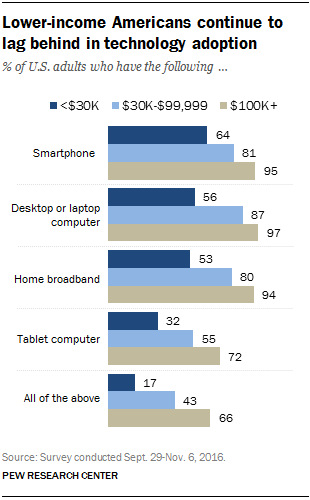 Higher-income Americans are also more likely to have multiple devices that enable them to go online. Two-thirds of adults living in high-earning households have home broadband services, a smartphone, a desktop or laptop computer and a tablet, compared with 17% of those living in low-income households. And with fewer options for online access at their disposal, many lower-income Americans are relying more on smartphones. 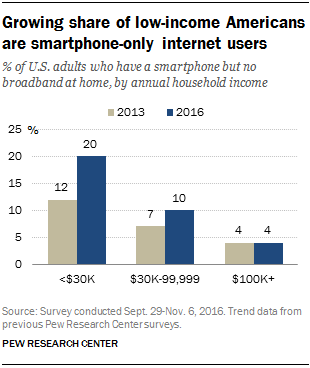 In 2016, one-fifth of adults living in households earning less than $30,000 a year were “smartphone-only” internet users – meaning they owned a smartphone but did not have broadband internet at home. This represents an increase from 12% in 2013. In contrast, only 4% of those living in households earning $100,000 or more fell into this category in either year. This reliance on smartphones also means that the less affluent are more likely to use them for tasks traditionally reserved for larger screens. For example, lower-income smartphone owners were especially likely to use their mobile device when seeking out and applying for jobs, according to a 2015 Pew Research Center report. The disparity in online access is also apparent in what has been called the “homework gap,” or the gap between school-age children who have access to high-speed internet at home and those who don’t. Some 5 million school-age children do not have a broadband internet connection at home, with low-income households accounting for a disproportionate share. The digital divide has been a central topic in tech circles for decades with researchers, advocates and policymakers examining this issue. Just last month, Federal Communications Commission Chairman Ajit Pai reiterated his commitment to bringing high-speed internet services to low-income communities, though there are partisan differences in views of how this should be carried out. Adoption rates are only one component of the digital divide, however. A person’s comfort level with technology and the rate in which they use the internet at work and in their everyday lives also varies by income group. Other Pew Research Center data show that while 81% of workers whose annual household income is $100,000 or more spend at least some of their day using the internet for work-related tasks, that share drops to 36% among workers living in lower-income households. Similarly, lower-income adults are less likely to say they “almost constantly” use the internet. And when it comes to their ability to use technology, lower-income Americans are more than twice as likely as those in other income groups to be classified as digitally unprepared.